If a home is a man’s castle, then a mancave is his refuge away from the rest of the world. It’s a place where he can go to relax, to watch the big game on a big television with friends or by himself. But as any true owner can attest, it’s not a man cave without food and beverages. After all, one rule, is that the fridge is required to be stocked full of drinks and all kinds of good food. But all those essentials can’t be put into just any kind of refrigerator. They’ve got to be put into a manly fridge, the kind of fridge that shows the world what this man cave and its owner are all about. No matter what type of mancave you have, there is a refrigerator that’s made just for you and this article will detail several ideas. A true sports fan displays love for their favorite team any way possible, and that includes their refrigerators. Sports-themed fridges are popular additions, and some of the best are the compact mini-fridges. Easy to place anywhere in the room, they show devotion to anyone’s favorite team. One of our favorites is the NFL Portable Party Refrigerator. With a capacity of almost 16 quarts and the ability to run on 12 volt DC power or 110 volt AC power, it’s a great combination of size and portability. 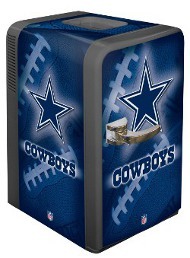 The fridge comes in all 32 NFL football team colors, and would make a great gift for any man cave. Best of all you can take it with you when you are out tailgating. Or better yet this mini fridge only weighs 15 pounds so you can haul it out to the backyard when you are entertaining using the barbeque on hot summer day. There is nothing better than a nice cold beer and BBQ while watching the game outside. Not all man caves, however, need to have a sports theme. For those who love their music, there are many music-themed man cave mini fridges on the market as well. 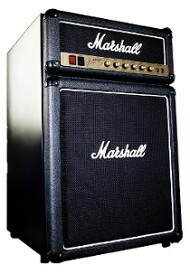 One of the best is the Marshall Amp Mini-Fridge. Made to look just like an amplifier on the outside, the inside can hold a variety of your favorite beverages to have after a long jam session in the mancave. Complete with a freezer section as well, this fridge instantly transforms any space into a cool place to be. Definitely gets a 5-star rating for its coolness, and also for looking so realistic. Having this in your man cave will be worth it just to see your buddies trying to plug in their guitars to the refrigerator. But hey you are cool dude rocking out in your manly space and having this mini fridge will keep you and your bros playing without interruption for cold drinks. Sometimes it’s great to sit around, watch the big game and think of days gone by. When in your man cave, nothing can help to do this more so than having a nostalgic-look fridge. With one of these, having a cold beverage is at your fingertips anytime you wish, and it makes a great addition to any room. There are many people, places and things which can bring to mind nostalgic refrigerator ideas. Coca-Cola is one of the iconic brands in American history. One of the best nostalgic fridges is the Koolatron 10-can Vending Fridge. Made to look like a Coca-Cola vending machine, this fridge is compact, dispenses the cans vending-style and looks really cool. The reasonable price, cool look and number of cans it holds makes this a must have, but we noticed the cans that are higher up are a bit too shaken up for our liking when they drop down and are dispensed, so be careful when you open those cans. Sometimes you find the perfect fridge is one that’s plain on the outside, but can hold everything you need on the inside. However, all is not lost. After all, no man cave can have a plain-looking fridge. When faced with this dilemma, the true bro pad enthusiast rises to the challenge by purchasing a medium-sized fridge and customizing it with skins. One of the most popular models is the Danby Designer Compact Fridge. Measuring 4.4 cubic feet, it’s the perfect size for any dwelling. With this fridge in your mancave, you’ll never have a need to run to the kitchen during commercials or halftime. The adjustable shelves, quiet operation and reversible door make this a versatile and functional fridge. It comes in black and white colors but color may not matter much once you skin the fridge and decorate the fridge with your favorite man cave accessories. For some caves, a plain fridge is sometimes the best fridge when it comes to performance. However, a plain fridge does not always have to stay plain. These fridges are designed to be fitted with skins to turn them from plain boxes into fridges that will garner the attention of everyone in the room. No matter your theme, there is a refrigerator skin to accommodate you. Sports themes, Union Jack flags, skulls and crossbones, flames and more are all available for you and your fridge. Most skins cost much less than you think, which is a reasonable price to pay for something that not only looks good, but is also durable. Most of these are one size fits all, though a utility knife is usually needed to trim it to the exact specifications of your fridge. They’re made of UV resistant materials, allowing them to be placed in direct sunlight without fading for a minimum of 3 years. They also have a glossy exterior finish, letting them shine in your mancave. In our opinion, it’s an easy and inexpensive way to dress up any fridge. If you’ve got a big mancave, then you need a big kegerator among your man cave appliances. Able to hold 2 5-gallon kegs or one full-sized keg or a pony keg, these kegerators are the ultimate in keg luxury. One of the more popular large kegerators today is the Nostalgia Electrics KRS 2100 Keg Fridge. Available in black and stainless steel, it costs $359 and seems to be well worth the price. The dispenser on top makes filling up the beer mugs a breeze, and it’s on wheels to make it easy to transport from room to room if necessary. We really liked its ability to keep the beer carbonated for several weeks, and also liked its temperature range of 30-40 degrees Fahrenheit. The one drawback, and it’s a minor one, is that it’s only designed for indoor use. But with all things being equal, this makes a great addition to any style. No mancave is complete without a kegerator in its midst. If you want the best of both worlds, a kegerator is a must-have. Able to hold a standard 5L mini-keg, they not only keep the beer cold, but flowing as well. With the dispenser included, it allows you to never run out of suds while the game is going on. If you’re looking for a small kegerator, the EdgeStar Mini-Kegerator is a good choice. It’s affordable enough for any budget. The compact size of this mini kegorator means it will fit nicely in those smaller man spaces. it measures 15 inches high by 15 inches wide so you can tuck in a storage cabinet. 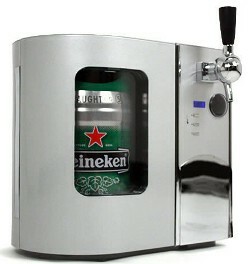 It is also a nice man cave appliance to keep on the countertop ready to dispense a nice cold beer at a moments notice. You never know when your buddies are going to spot by! Check out the pictures, it looks cool too. If you enjoy DIY projects, it’s possible to take parts from old refrigerators and create one all your own. However, this can take quite a bit of time scouring for parts, and can also pose some concerns when trying to regulate the temperature. But if you’re up to the challenge, it can be done. Many manly spaces are filled with homemade creations with team logos, pictures and other artwork displaying the personality of the room and its owner. While it can be cheaper than buying a new fridge, we think you’ll be happier in the long run if you purchase a new model with your team’s colors to keep the food and beer ice cold. So while there are many refrigerators on the market, choosing one can be a tough decision. Before buying the first one you see, take into account the size of the mancave, the capacity of the refrigerator, how it will be used and other aspects. By doing some research, you can find the fridge of your dreams.